Instant downloads of all 946 LitChart PDFs (including King Lear). New! 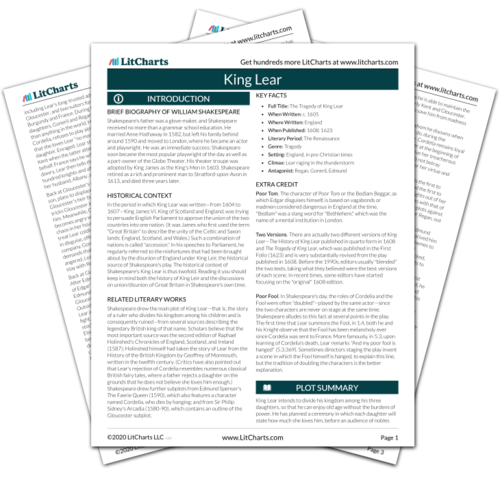 Understand every line of King Lear. LitCharts assigns a color and icon to each theme in King Lear, which you can use to track the themes throughout the work. Inside the house to which he has shown them, Kent thanks Gloucester, and then reports that Lear has gone entirely mad. Gloucester exits as Lear, the Fool, and Edgar enter, raving together. Lear has Edgar and the Fool sit down, announcing that they are the jury for an imaginary trial of the "she-foxes" (24) Goneril and Regan, which he persists carrying out as Kent entreats him to rest and Edgar remarks that he is finding it difficult to restrain his tears. Carrying out the imaginary trial—which is almost like a mad parody of the ceremonial love-test Lear put his daughters to in the first scene of the play—Lear shows how far he has descended into madness. Ironically, in this hallucinated parallel trial he has better insight into the nature of the "she-foxes" (and what he now knows as their animal heartlessness) than he did in 1.1. In the middle of the trial of Regan, Gloucester returns. Told once again by Kent that Lear's "wits are gone" (92), Gloucester tells Kent that he has overheard a plot against Lear's life. Gloucester then says he has arranged for Lear to be secretly transported to Dover in a litter. He asks Kent to help him get Lear on the litter. All exit except Edgar, who remains on stage. Briefly stepping out of the character of Poor Tom, Edgar expresses his deep pity for Lear, saying that he feels so badly for Lear that he can hardly feel his own pain. Yet he also remarks on the similarity between the two of them: "he childed as I fathered" (120). Then he exits as well. Like Kent, Gloucester shows himself willing to risk himself personally out of loyalty to Lear and what he perceives as right political order (Lear in power, allowed to maintain control) and familial order (Lear not subject to cruelty by his daughters). Although his father continues to misrecognize him, Edgar's moment of pain explicitly draws out the similarities between the Lear/Cordelia and Gloucester/Edgar situations. Weigel, Moira. "King Lear Act 3, scene 6." LitCharts. LitCharts LLC, 22 Jul 2013. Web. 16 Nov 2018. Weigel, Moira. "King Lear Act 3, scene 6." LitCharts LLC, July 22, 2013. Retrieved November 16, 2018. https://www.litcharts.com/lit/king-lear/act-3-scene-6.